A subscription gives you unlimited access to all courses and all videos in our video library. This is the Course you want to view for all the recorded live Webinars/SESSIONS. They have been separated into videos that focus on either Self Defense or Yoga; sometimes both! One of the most worrisome issues for those who carry a cane, is having it forcibly taken away. In this video GM Shuey and Master Ken Job demonstrate a variety of techniques designed to keep your cane in your possession. SESSION-Mini-Canes, Sticks and Staffs OH MY! In this Session, GM Shuey discusses some of the other self-defense "tools" that you may think about adding to your personal collection. From the "Little Helper" to the "Bokane", Mark will show you what you can do with these old and new weapons. SESSION-Crook Work; self-defense techniques using the crook of the cane with one or both hands. Arguably the crook of the cane is what sets this self-defense tool apart from all others. With the crook, one can trap, throw, strike, coerce and ultimately control and/or subdue an attacker. Join GM Shuey as he demonstrates a wide variety of techniques using this unique and effective tool. In this short webinar, GM Shuey shows you the steps in creating your own kata. Whether for a tournament, as testing material or just for your own practice, Grand Master Shuey demonstrates how he put together his award winning form! SESSION-Custom Cane Accents and Carrying Your Cane. Many folks are concerned about carrying their cane through an airport, and whether they will be allowed to take it with them on the plane. In this webinar GM Shuey explains how the "accents" we put on our canes facilitate using the cane as a medical device. He also discusses using the proper terminology when being addressed by TSA or other security people. GM Shuey visited the Eastern Headquarters of the American Cane System this past weekend (September 10, 2017). While there we recorded a short introduction to GM Crandall and Master Stalloch, both of whom were instrumental to the production of the ACS Video Series.In fact, both of these men demonstrate their favorite defensive techniques from the series. Arguably one of the single best training exercises you can do with your cane is a heavy bag workout. It works on your technique, focus and power. GM Shuey suggests that you perform this workout once a week if possible. GM Shuey along with Mike Allen and Paul De Luca demonstrate warmups and stretching as well as self defense techniques. GM Shuey also explains the importance of proper warmups to avoid injury and increase muscle strength. As a self defense tool, the cane is wonderful! You have a 36" hardwood stick in your hands that can block just about anything coming at you. BUT, its not just about blocks! GM Shuey discusses how imperative it is to follow up every block with a strike or two, and demonstrates a wide variety of techniques. SESSION-The Cane, Elbows, Knees and Bob! Yes, the cane is arguably one of the most effective self defense tools around. That said, don't forget that you have other "weapons" at your disposal; hands, elbows, feet, etc. Learn how to utilize those tools along with your cane as demonstrated by GM Shuey in this video. Of course the best way to improve your cane self defense techniques is practice. And one of the best ways to practice is with a partner. In this session, GM Shuey and Master Ken Job walk you through a "give and take" series of routines that will help you increase your skills and be better prepared to use your cane for self defense. 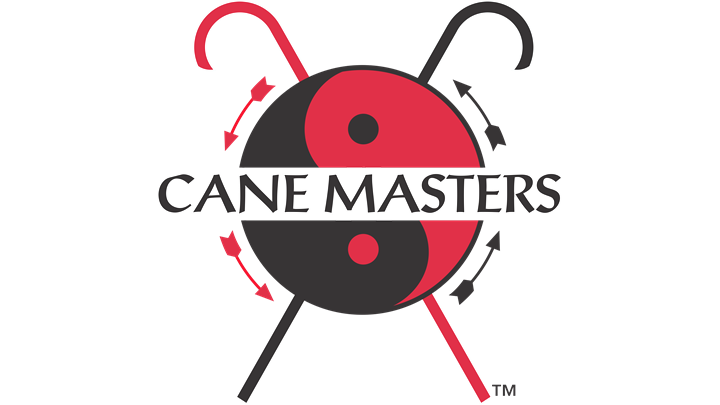 In this Session GM Shuey talks about becoming a Cane Fu Facilitator as a way to progress to the Black Belt ranking in the American Cane System. In this Session, GM Shuey shows you not only how effective a cane be at its "normal" length, but also "close up and personal". He will demonstrate how to use the cane at a variety of different distances. GM Shuey talks about the American Cane System, Cane-Fu Facilitator program as well as the Warrior Cane Project. GM Shuey more of the versatility of the cane in this video by demonstrating isometeric and isotonic exercises while sitting in a chair. Plus, he shows just a few of the many extra features of the Deluxe Therapy cane. In this Session GM Shuey answered questions from his personal experiences starting in the martial arts to questions around the construction of canes to yoga. Footwork is at the core of all martial arts, and self-defense with the cane is no exception! In this Session, GM Shuey talks about the importance of foot movement and placement. In this Session, GM Shuey offers a "free form" work out with and without the cane. Stretching, balance, exercise and self defense are all covered in this video. In addition, he talks about the importance of learning how to walk with your cane, as well as being aware of your surroundings. SESSION: He's Back! Join GM Shuey for a discussion all about the Cane Fu Facilitator Program. Want to start your day with an energizing yoga routine? Then this is the one you want! GM Shuey takes you through vitalizing workout that will help keep you supple and flexible as well as works on your breath and balance. All this in under 1/2 an hour! Yoga has been an integral part of Grand Masters Shuey's training and health for many years. His world and national competition titles are due in no small part to his yoga practice. Follow along with GM Shuey as he demonstrates several of the basic "asanas" or poses to help get you on the road to better health and performance. This is Part 1 of GM Shuey's favorite 1-1/2 hour yoga workout. In this video, he starts with some basic warmups, and then moves into strength and flexibility poses. Though yoga is arguably one of the best forms of exercise for fitness, be sure to check with your personal health professional(s) to be sure you are able to safely perform the techniques shown. In Part 2 of GM Shuey's Favorite Yoga Workout, Mark will take you through a complete exercise program guaranteed to get you sweating! In part 3 of GM Shuey's favorite yoga workout, Mark focuses on breathing and the importance of breathe work in your personal exercise regimen. In Yoga, as in life, breathing is paramount. Yogis call breath exercises "pranayama". Follow along with GM Mark Shuey as he demonstrates techniques that have been taught for thousands of years to help strengthen you life-force. Plus, you will learn an exercise incorporated with the breathing exercises that will "massage" your inner organs called "Belly Bouncing"! Balance is one of the most ignored facets of exercise. And, it is the one that fails us most as we age. GM Shuey was teaching a seminar in Florida last month and asked the attendees, "How many of you have trouble balancing?". Almost to a person, everyone raised their hand! In this session, Mark will show you exercises designed to help you "add more balance to your life" with and without the aid of a cane. SESSIONS-The Legalities of Carrying a Cane. In this Session, GM Shuey talks about the fact that you can carry your cane anywhere legally. A lot of it had to deal with perception; are you handling your cane in an aggressive manner or simply walking with it? When someone asks what the carvings are on the shaft of the cane, do you say "These are Shark's teeth" or "They help keep my exercise band from slipping off my cane"? Mark also talks about some of the exciting new "cane carvers" we have hired, as well as where he will be traveling to at the start of the New Year. SESSION-Flash Webinar! The Importance of Balance. Follow along with GM Shuey as he shows you the yoga practice that has helped him over the years to strengthen and increase flexibility in his back. SESSION-In this Session, GM Shuey takes you through a complete "soup to nuts" cane and yoga workout. Stretching, breathing, balance, blocks, strikes it's all here in one video! SESSION-Balancing with Your Cane to perform kicks, following up with a Cane Technique and Yoga. Follow along with GM Shuey as he demonstrates stretching/warmups preceding a great cane and yoga workout! GM Shuey takes you through an intense 1-1/2 hour workout. Grab your water bottle and join him for this vigorous session. Enjoy over 45 minutes of working out with GM Shuey in this Session.